Taking a couple days off to sew, relax and be with family. Hope you all have a good weekend full of peace and with those you love. Have a wonderful weekend! I love that flag! Love the flag. Happy 4th of July Weekend. Happy July 1st to us here in Canada! Good for you!! Have a great and relaxing weekend! 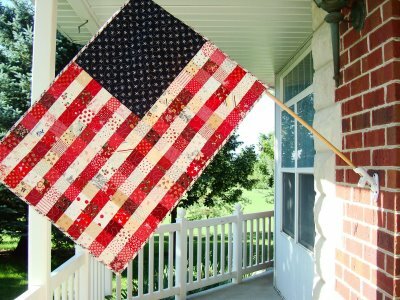 What a beautiful flag quilt! I hope your holiday weekend is wonderful as well. Enjoy your holiday! Your flag is pretty darn special. What a special flag Nanette! Enjoy your weekend. exactly how old did USA now? And a happy 4th to you too, Nanette! HAPPY 4th of JULY, Nanette! I hope you had time to sew and spend lots of time with your loved ones. There's that flag again! Thank you again for sending me the .pdf. It's still saved in my email! Love how you have hung your flag quilt in such an innovative way!